We believe that every student should have access to education that prepares them to succeed in school and life. We believe that investing in education creates a foundation for a better future for all of us. We support programs that encourage a child’s success in a safe environment and that foster learning in all subjects, including after-school activities as well as other interventions. Our funding is specifically for K-12 education in schools and in out-of-school organizations that increase test scores, classroom performance and/or attendance. United is proud to serve as the City Champion for Lubbock Lemonade Day and we enthusiastically support the mission to help today’s youth become the business leaders, social advocates, community volunteers and forward-thinking citizens of tomorrow…one lemonade stand at a time! 3,528 area students spend the spring learning how to create a business plan, procure product, attract customers, and grow sales. 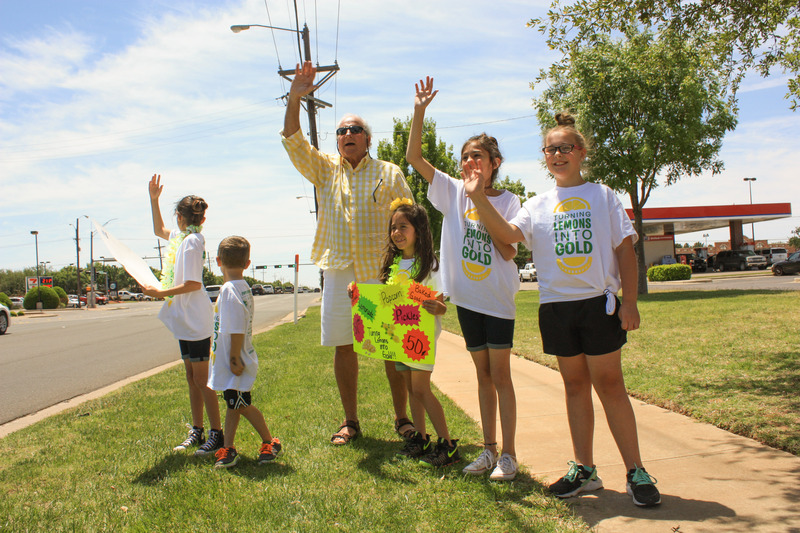 In addition to teaching financial literacy and the value of hard work, the program teaches kids the benefits of using their profits to spend some, save some and donate some to a charity.On Lemonade Day, 882 new business sprang up around town, many in front of United stores. In partnership with Texas Tech University, eight scholarships were awarded including one to the 2017 Entrepreneur of the Year, Matthew Noel. He showed innovative moxie and entrepreneurial spirit when he approached area businesses with the idea of matching his profits. Matthew’s goal was to make as big a donation as possible to the Burkhart Center for Autism and Research. Area businesses jumped at the chance to support this enthusiastic young man. We are proud to report that his corporate partners and his business profits made possible a donation of more than $4,600 to the Center. 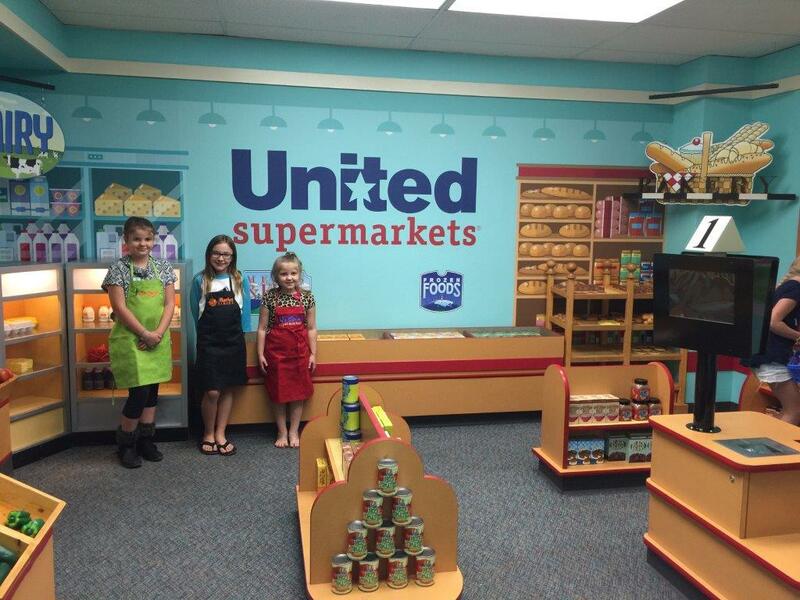 United has partnered with the Science Spectrum to give children a fresh hands-on experience to better understand modern grocery shopping with the opening of the new United Supermarkets Kids Market. After pushing little shopping carts through our stores for years, now tiny shoppers at the Science Spectrum have a grocery store of their own to play in. Since its founding in 1916 by Henry Dewitt Snell, The United Family has been dedicated to giving back to those who so faithfully support its grocery store banners including United Supermarkets, United Express, Market Street, Amigos and Albertsons Market. By partnering with local food banks and community organizations the company is committed to improving and benefiting the communities it serves throughout West Texas, Dallas-Fort Worth (DFW) and Eastern New Mexico. Listed below are several community relations efforts The United Family executed throughout 2016 in an effort to show appreciation to its guests. The United Family celebrated a historic milestone in 2016 with the 100th Anniversary of United Supermarkets. The company commemorated a century of service with an entire year of initiatives to benefit the communities it serves throughout West Texas, DFW and Eastern New Mexico. In January 2016 The United Family launched its Shop to Support Schools program followed by Take a Bite Out of Hunger in April, the 100 Days of Giving campaign in May, food bank donations in June and hospital donations in November to close out the year. Each of these initiatives are outlined individually below. Shop to Support Schools was a school donation program which allowed guests of The United Family stores to link a school of their choice to their rewards account and earn points for the school each time they shopped between Jan. 13 and Oct. 15. 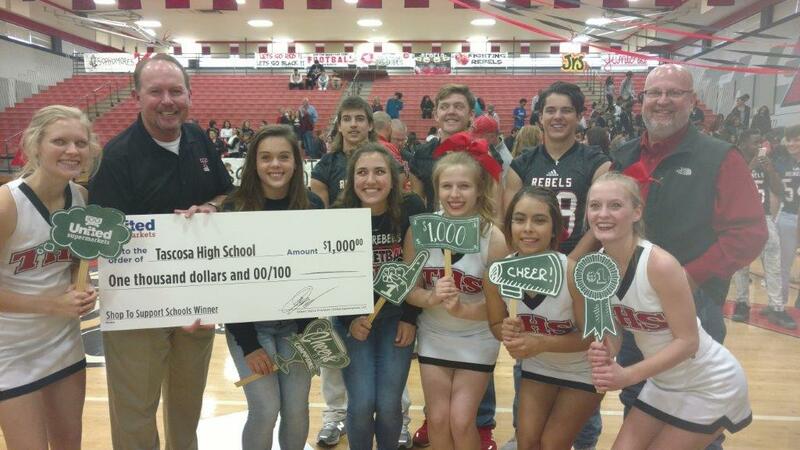 2016.Based on the percentage of each schools shopping activity, at the end of the earning period the company awarded $1,000 to 100 schools throughout its communities. Winner celebrations ranged from store check presentations to full-fledged school assemblies. How could $5,000 to $10,000 improve, advance and enrich student learning? 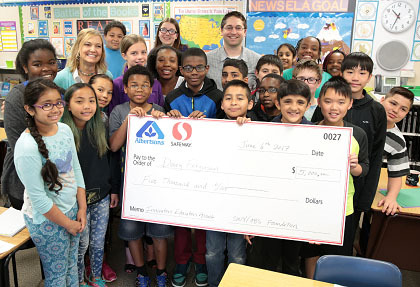 Safeway and Albertsons know that teachers in our community can think of many answers to this question, and that’s why the Safeway Foundation and the Albertsons Companies Foundation is proud to have created the Innovation in Education Grant. K-12 grade Teachers from across Washington State and Alaska applied for the grant by submitting ideas for creative projects in literacy, math, reading, science, health, engineering and social studies. 50 teachers were awarded grants equaling $250, 000. On December 19th, 1,566 toys, along with a $1,000 donation, were presented to Master Sergeant William Garvey, the United States Marine representing the Massachusetts chapter of Toys for Tots. This was made possible by the heart-warming generosity of our teams at the Shaw’s Store Support Center and the following districts: SE/MA Cape, Rhode Island, and Star Market. – Shaw’s stores collected toys for the Toys for Tots program. Over 21 bins filling up a tractor trailer were donated to the non-profit organization. – And, Shaw’s Distribution Center in Wells, Maine also donated hundreds of toys to the organization. Over 10 years ago, that objective was the lofty goal Albertsons Companies Foundation and The Vons Foundation began a long-term, multi-level strategic partnership with LA’s BEST After School Enrichment Program to improve the communities the two organizations both serve. The Foundation and LA’s BEST agree: growing healthier habits in the city’s children today leads directly to brighter futures tomorrow. The Foundation has underwritten the LA’s BEST Annual Family Health Festival. Each year, both the children in the after school program and their families attend an outdoor event that combines fun in the sun, healthy food demonstrations and tastings, photo opportunities with famous athletes, and demonstrations of enjoyable forms of exercise like double-dutch-style jump-roping and zumba dancing. The Foundation has sponsored the installation of edible gardens right on the campuses of LA’s BEST schools. These native plants create local habitats that attract birds, butterflies, and insects, which pollinate the edible plants, helping the gardens to thrive. LA’s BEST also uses the gardens as outdoor classrooms to teach urban youth the basics about growing food, good nutrition and maintaining a healthy lifestyle. Children plant seeds, maintain the gardens, learn ecology, harvest fruits and vegetables, and use the produce in nutrition workshops. Even the students who are not enrolled in LA’s BEST benefit from the on-campus oasis for reading or relaxing, as well as the aesthetic appeal the gardens add to the asphalt and concrete. These gardens benefit children in neighborhoods that frequently have a lack of healthy food options, and have suffered from the associated health problems for generations. But it doesn’t end there. The Albertsons Companies Foundation and The Vons Foundation also provides employees on-site as volunteers for installations, events, maintenance of the grounds, and gardening projects. This long standing partnership is a vivid example of the value of expanded learning, an approach to education that LA’s BEST advocates. LA’s BEST students learn about math, science, biology, geology and nutrition in an engaging, tactile environment by building and maintaining these gardens. Without the support of The Albertsons Companies Foundation and The Vons Foundation, this wouldn’t be possible. The mission of LA’s BEST (Better Educated Students for Tomorrow) After School Enrichment Program is to provide a safe and supervised after school education, enrichment and recreation program for children ages five to 12 in the City of Los Angeles. Mayor Tom Bradley created LA’s BEST in 1988 in response to challenges arising from increasing numbers of unsupervised children throughout the city during out-of-school-time – especially within economically-distressed Los Angeles neighborhoods that are disproportionately impacted by high rates of poverty and crime. LA’s BEST has grown from operating at 10 Los Angeles Unified School District (LAUSD) elementary school sites to 194, and currently serves more than 25,000 children each day during the after school hours, and thousands more in the LA’s BEST Summer Program each year. As this fruitful partnership continues to grow this spring, The Albertsons Companies Foundation and The Vons Foundation sponsored a garden makeover at Crescent Heights Elementary. LA’s BEST will also host its Annual Family Brunch on Sunday May 22nd, 2016. To learn more about LA’s BEST, visit www.lasbest.org. 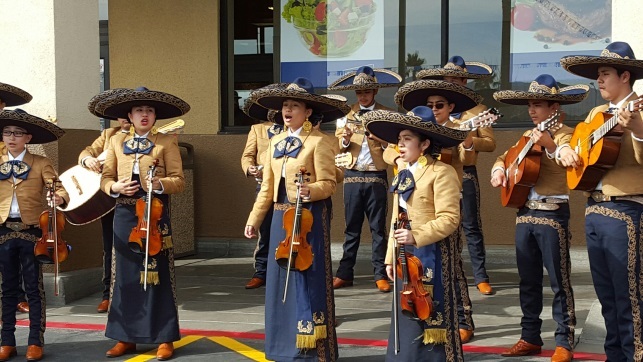 Three Clark County Nevada Schools have been awarded a total of $18,000 in grants from the Albertsons Companies Foundation to help strengthen the school district’s mariachi band programs. One of the schools is Monaco Middle School in Las Vegas. Ramiro Benavides is their full-time mariachi educator for the Monaco Middle School Mariachi program, Mariachi Los Gavilanes de Monaco Middle School. In only a few short years, mariachi student enrollment at Monaco Middle School has skyrocketed from 99 students to over 460 mariachi students. The Monaco Mariachi band consists of guitars, trumpets, violins, and sometimes even a harp. Musical instruments, along with authentic mariachi attire can be very expensive. That’s why Monaco Middle School is thrilled to be receiving an $8,000 grant. Mariachi Los Gavilanes has a strong following. Recently they performed at two Albertsons Grand Opening events in Henderson, Nevada and Lake Havasu City, Arizona. The band has also represented the Clark County School District with performances throughout Arizona, California, Nevada, New Mexico, and Texas. In addition to Monaco Middle School, Mariachi Oro of Rancho High School and band educator Robert Lopez will receive a $5,000 grant along with the Del Sol High School Mariachi Program and Guadalupe Gonzalez, band educator will also receive a $5,000 grant. 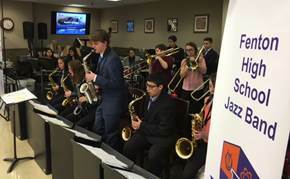 In January during the Grand Opening of Jewel-Osco 185th store in Bensenville, Illinois we presented Fenton High School (based in Bensenville) with a check for $2,500 and had the school’s jazz band perform at our grand opening. It is known that the best way to end the cycle of poverty is through education, yet only 10% of low-income youth graduate from college. One great organization in Washington – College Success Foundation – is changing that statistic, with 60% of the youth in their program earning a college degree. Through an integrated system of academic, financial, social and emotional support for students, more than 12,000 student per year are charting the path to success for their families. This May, through the generous donations of our customers, the Albertsons Safeway Seattle Division raised $422,000 for College Success Foundation to support their in-school programs in improving high school graduation rates among underserved students. 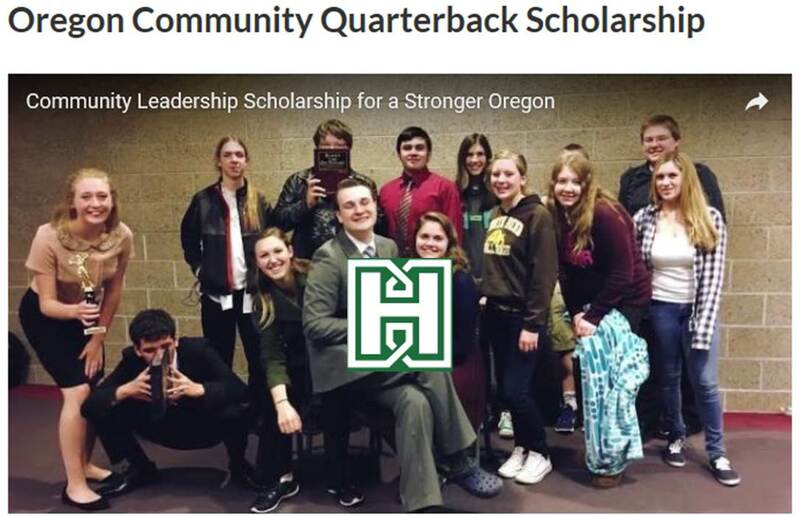 The Safeway Foundation is teaming up again in 2016 with the Harrington Family Foundation, to provide scholarships for Oregon students. Through in-store donations by both customers and employees, at Safeway and Albertsons stores, we will donate over $400,000 this year to help send our kids to Oregon colleges. We “Huddle Up” with Joey Harrington to help support education! 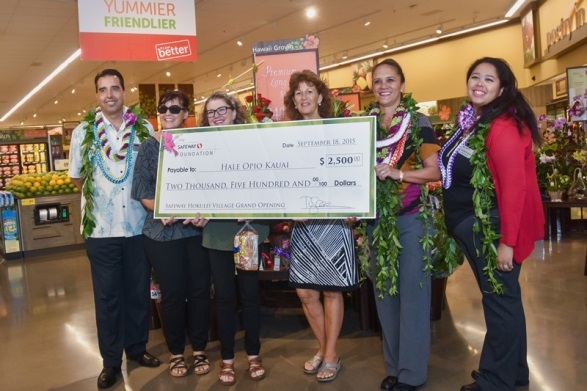 To celebrate the opening of the Lihue store on Kauai, The Safeway Foundation made check presentations and donations to three Kauai nonprofit organizations ($2,500 each) – Chiefess Kamakahelei Middle School, Kauai Junior Lifeguard Association and Hale Opio Kauai, which provides residential and community programs for education, prevention, diversion and treatment for youth and families. Our employees volunteered for a day at Frederiksen Elementary School in Dublin to teach students about financial literacy, entrepreneurship, and work readiness through Junior Achievement. 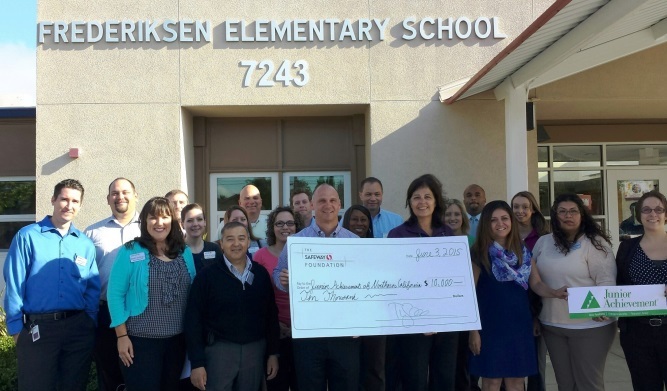 Junior Achievement of Northern California received a $10,000 grant through our Foundation. 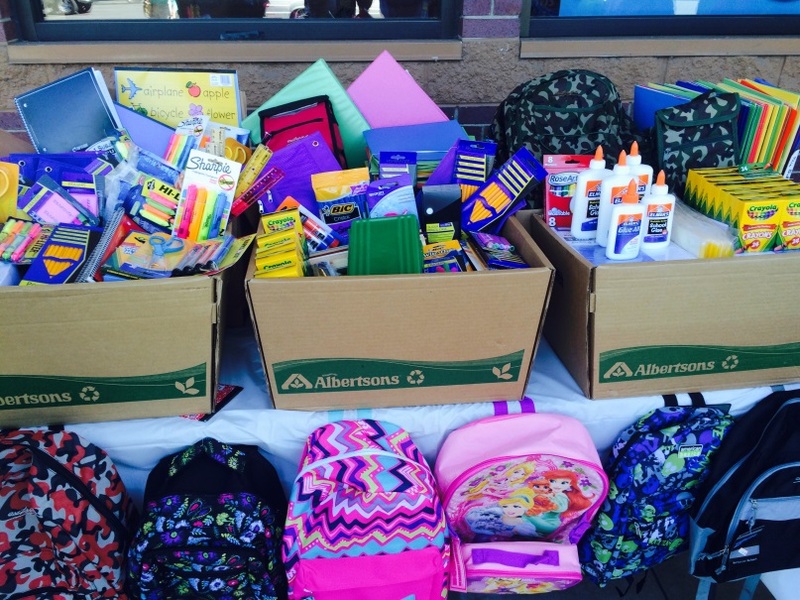 The Albertsons Companies Foundation partnered with radio station, 100.3 The X for a school supply drive in our Treasure Valley stores in August 2015 to benefit Family Advocates, an organization that provides court representation for children in foster care. Our amazing customers donated several school supplies and our vendor partners also came together to donate a pallet of supplies. The Albertsons Companies showed our support as well by donating a check for $1000. We focus on giving locally to help strengthen neighborhoods and change lives. Dedicated to bettering the lives of people in our neighborhoods. Copyright 2019 Albertsons Companies Foundation. All Rights Reserved.